This is an essential resource for anyone designing or facilitating online learning. It introduces an easy, practical model (R2D2: read, reflect, display, and do) that will show online educators how to deliver content in ways that benefit all types of learners (visual, auditory, observational, and kinesthetic) from a wide variety of backgrounds and skill levels. With a solid theoretical foundation and concrete guidance and examples, this book can be used as a handy reference, a professional guidebook, or a course text. The authors intend for it to help online instructors and instructional designers as well as those contemplating such positions design, develop, and deliver learner-centered online instruction. Empowering Online Learning has 25 unique activities for each phase of the R2D2 model as well as summary tables helping you pick and choose what to use whenever you need it. Each activity lists a description, skills addressed, advice, variations, cost, risk, and time index, and much more. This title is loaded with current information about emerging technologies (e.g., simulations, podcasts, wikis, blogs) and the Web 2.0. 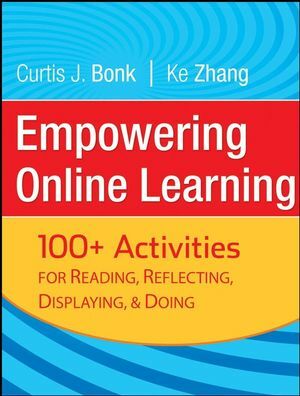 With a useful model, more than 100 online activities, the latest information on emerging technologies, hundreds of quickly accessible Web resources, and relevance to all types and ages of learners--Empowering Online Learning is a book whose time has come. Curt Bonk is Professor of Instructional Systems Technology and adjunct in Informatics at Indiana University. He also spent 15 years as a professor of educational psychology. Dr. Bonk has received the CyberStar Award from the Indiana Information Technology Association, the Most Outstanding Achievement Award from the U.S. Distance Learning Association, and the Most Innovative Teaching in a Distance Education Program Award from the State of Indiana. He has over 200 publications, including the Handbook of Blended Learning Environments: Global Perspectives, Local Designs (Pfeiffer, 2005), and during the past three years he has presented nearly 300 talks related to online teaching and learning, including ones at universities in China, Australia, Korea, Finland, Ireland, Taiwan, Malaysia, Spain, Iceland, the UK, and the United Arab Emirates. Ke Zhang is an Assistant Professor of Instructional Technology at Wayne State University with a Ph.D. in Instructional Systems from Penn State University. She has years of success in designing, developing and teaching online courses and programs, together with fruitful research on online learning. 1 The R2D2 Model: Read, Refl ect, Display, and Do. 2 Phase 1 of the R2D2 Model: Verbal and Auditory Learners. 3 Activities for Phase 1: Verbal and Auditory Learners. 4 Phase 2 of the R2D2 Model: Refl ective and Observational Learners. 5 Activities for Phase 2: Refl ective and Observational Learners. 6 Phase 3 of the R2D2 Model: Visual Learners. 7 Activities for Phase 3: Visual Learners. 8 Phase 4 of the R2D2 Model: Hands-On Learners. 9 Activities for Phase 4: Hands-On Learners. 10 Integrating R2D2 and Final Refl ections on the Web of Learning. Web Links, Examples, and Resources.